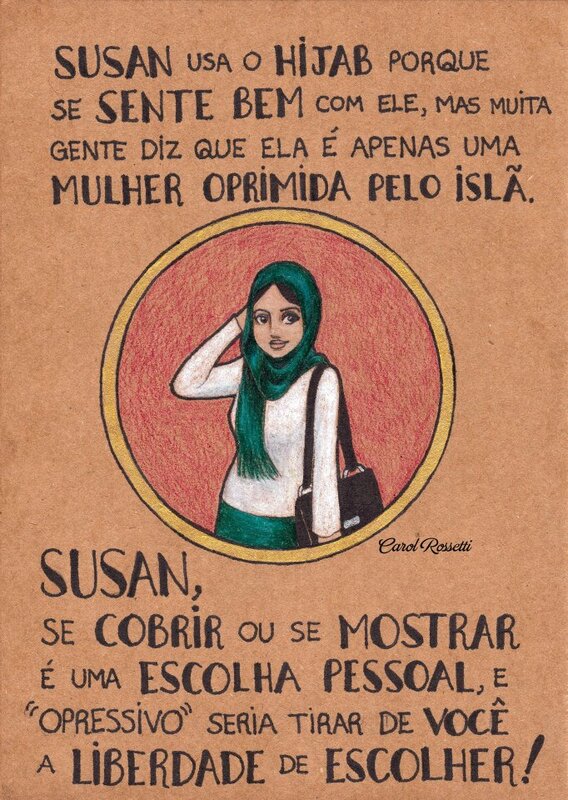 Carol Rossetti is a designer and illustrator from Brazil, who has been making waves in feminist spaces lately with her series of illustrations entitled simply “Women“. 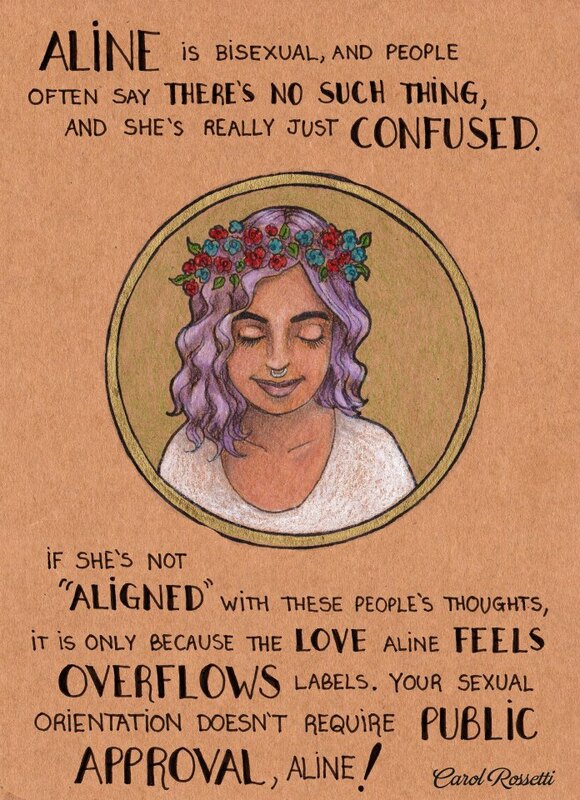 The illustrations generally depict a woman dealing with some societal attitude towards her choices, appearance or identity, and include a positive message of support and solidarity. But you are so much more than the way the media portrays you, aren’t you, Lorena? Your wheelchair is freedom and it can run over anyone who reduces you to stereotypes. 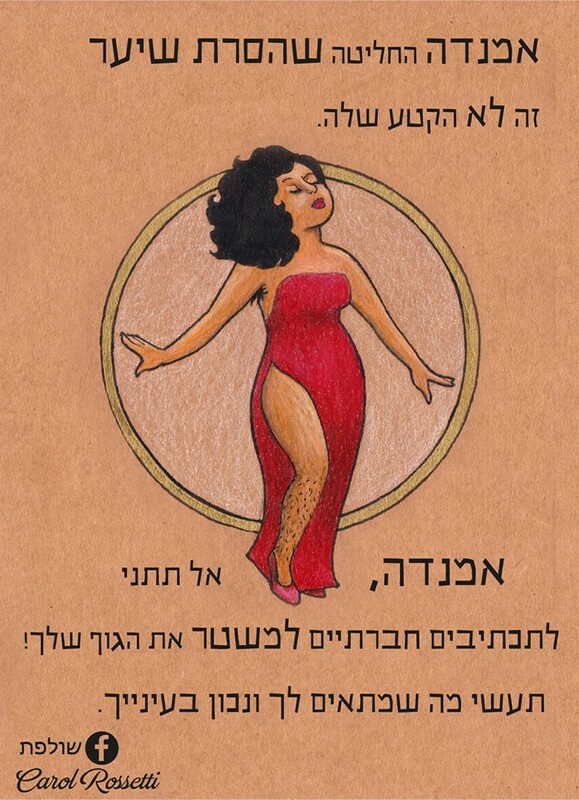 When Carol first started sharing translations of her work in English, they were widely shared, and suddenly feminists around the world wanted them in their own languages – the Tel Aviv based feminist collective Sholefet first translated them into Hebrew, and then they were translated into Spanish, and now they are being translated into such various languages as Arabic, Russian, Italian, Czech, Lithuanian, Hindi, Norwegian, Romanian, Japanese, Malayalam, Tamil, Bahasa Melayu & Bahasa Indonesia…. It’s fair to say Carol has sparked something of a movement! Carol was kind enough to answer Femina Invicta’s questions about her work, and why she thinks its appeal is so universal. Q: What does feminism mean to you? Can you tell us something about how your feminist consciousness has developed over time? That’s a really interesting question. Some people see me nowadays and think I’ve always been like that, and that’s not true. I grew up and changed a lot. I was born in a country full of prejudice and oppression despite the whole diversity we have. Even though my parents are wonderful people, everybody is affected by their culture, and I grew up believing in some nasty stereotypes. If you asked me ten years ago, I’d probably say something silly like “I’m neither feminist or sexist, I’m humanist!” Common attitudes got me to believe that feminism was something unnecessary for these times, that the fight was over, women already got equality and now feminism is just a bunch of man-hating unloved women. There was a long process of deconstruction of my own concepts and prejudices. It took a lot of research, a lot of listening, learning and thinking. Reviewing our privileges is not something easy to do, but it’s necessary. Q: What place does art fill in your life? Are there any particular artists that you are inspired by? Q: What do you think the connection is between art and feminism? I think feminism is something very important and very complex. It needs to be spread, to be talked about; it needs to get out of this bubble of young, white, European women. In so many parts of the world, feminism is still very misunderstood and unknown. And I truly believe that art and design can do a lot to make it easier to understand. When it comes to information, design can do a wonderful job. And when it comes to emotion, I think art is always a great answer. Q: Do you see art as a form of activism? How do you see feminist art fitting in with, or contributing to, other forms of activism? Art is expression. It expresses ideas, feelings, and identities. And none of those is detached from politics. We need to deconstruct this idea that politics is something for politicians. Politics is everybody’s business, and it’s not a synonym to bureaucracy. It’s pretty much in everything: our culture, our routines, our jobs… The only people who can really afford to think that politics is not their business are the ones that are very privileged. People who have never had anything denied to them because of their gender, sexuality, race, nationality, ethnicity and beliefs. The rest of us can’t afford this luxury, we need to fight every day to be respected and accepted. Some need to fight more, some need to fight less. But it’s really important to understand that art is not detached from politics because art IS politics in so many ways. Whenever we make a statement, whenever we say that something needs to change, whenever we realize there’s a fight to be fought… Well, that’s politics, and art is a tool that we have to express ideas and change the world. And feminist art is so very important! Now that we have so many people accessing the internet, I see a huge potential of reaching people, and that’s amazing! Q: Your “Women” series has become quite successful! How did the series begin? Did you expect it to make such waves? What are the most exceptional and/or exciting responses you’ve received? I’ve never really expected such visibility. I wanted to practice my technique with colored pencils on kraft paper and I thought I might as well do it while sending a positive message to my friends who already followed my page. I think what led me to it was a day when I saw this friend of mine sharing a photo on Facebook of a fat woman wearing yoga pants, and the caption was “ouch my eyes”. Well, I was really intrigued by how and unknown person’s dressing choice could be so annoying to someone that would get this person to say something so disrespectful about it on Facebook – which I believe is not that different from shouting it to a whole neighborhood. So my first drawing was about a fat girl wearing a horizontal stripes dress. But she had a name. She was called Marina. And she had a friendly face. And there was a text saying she loved that dress, and a friendly advice at the end to wear it and be happy. I guess it worked, because my friend shared this illustration and I’ve never seen her saying anything mean to other women ever since. On the contrary, she actually started sharing some feminist content that I never expected to see on her timeline! Now, the responses were very diverse. Most of them are very positive, people thanking me and telling me never to stop with it. A few of them were aggressive and/or disrespectful, but at the end I managed to handle it well. I was very shocked to see people thanking me and saying that my work really got them through a very difficult time in their lives. I didn’t see that coming. It’s amazing, but it feels weird, because I don’t really feel like I’m doing something amazing. My work feels really simple, actually. It’s good; I think so, but not genius. It’s really just about respect in the end. Q: Where do you get the ideas for the illustrations in the series? Are they based on real women? The characters are not real, but the situations are. Some of them I observed in my friends, my relatives or even myself. But I usually change names and features. Except for Whitney (which is Whitney Thore, the Fat Girl Dancing) and Aline (Aline Lemos, a fellow artist and friend). Q: The series has been very well received all around the world – what do you think makes women from such different locations and backgrounds identify with your work? I think gender oppression is something real all around, but in different ways. In this group we have on Facebook with all the translators, it was clear that there were differences, both in women’s rights and in cultural aspects. But still there is a common feeling that feminism is still necessary – in some places more than others, of course, but there’s still a lot to fight for. For example, maybe abortion is already legal in Japan, but on the other hand there’s an enormous pressure for women to get married there, as if they were not complete without a husband. So, there are many different aspects to be discussed. Q: What artists do you recommend? When it comes to illustrations and comics, I think there are many people worth getting to know. 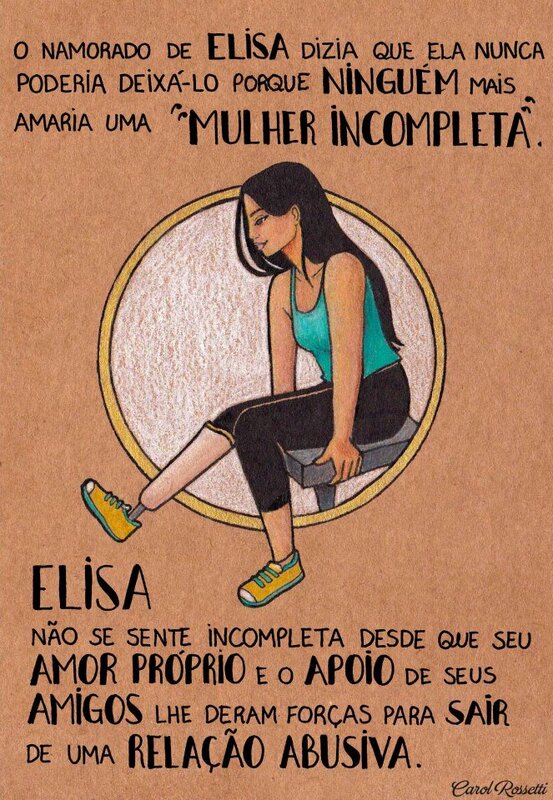 In Brazil I see many women with a fantastic work, like Aline Lemos, Samie Carvalho (who is actually in Japan, but she’s Brazilian too), Lu Cafaggi, Cris Peter, Bi Anca… There are the eternal great ones like Neil Gaiman, Will Eisner, Art Spiegelman, Craig Thompson, Marjani Strapi, Melind Gebbie… Oh, recently I read one from Israel that I really liked. It’s called “Farm 54”, from Galit and Gilad Seliktar. Q: And a sort of unfair question to end with – do you have a favorite from among your “Women” illustrations? Amanda, it’s your body, and you do whatever you want with it. No social convention should have a say in your identity. Last night, a couple dozens of Border Police and city police raided a closed cafe is South Tel Aviv, where one of the owners and an employee were closing down the kitchen and register. Police forced their way into the business, and attacked and manhandled the proprietor, Orly Chen. Both of the women were arrested. The barrista was released this morning, Chen is still in interrogation. 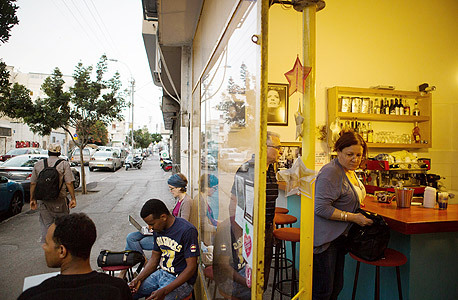 Apparently, a city inspector reported that Alby, the cafe, was open (though it was clearly locked) because a group of “Women in Yellow” (a grassroots group that has organized to patrol the increasingly violent streets of South Tel Aviv, which the police generally avoid and have become particularly dangerous to women) had wrapped up their patrol in front of the closed cafe. 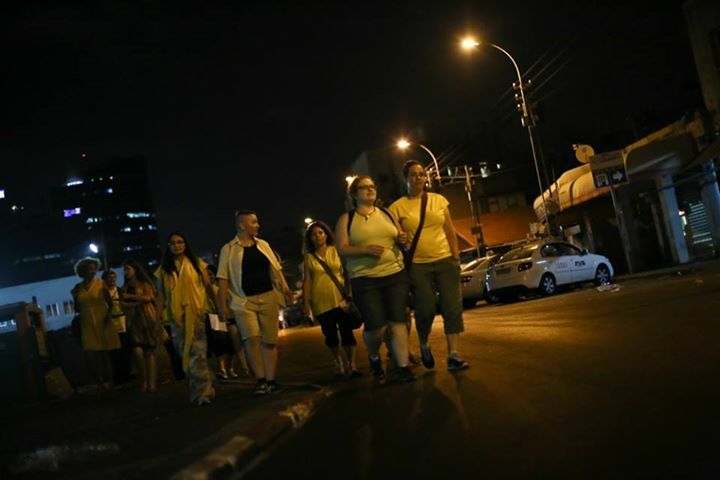 One of the founders of the Women in Yellow is activist Ortal Ben Dayan. And this is where the story begins to make sense: About 1-2 weeks ago, Ben Dayan confronted a Border Police officer who was being verbally abusive to a Palestinian family sitting at the cafe. 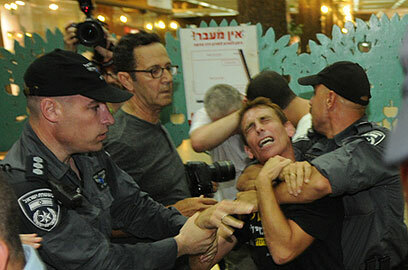 The officer proceeded to verbally abuse Ben Dayan, and demanded she provide identification. Under Israeli law, citizens have the right to refuse to identify themselves unless they are being detained under suspicion of a crime (and I believe they need to be informed what the crime is). Ben Dayan was clearly not under suspicion, and had no need to identify. The police officer then placed her under arrest, claiming she had “offended a public official”. After a night in jail and some legal ludicrousness, Ben Dayan was found to not be in violation of any law and was released. The officer who arrested her, on the other hand, was surprisingly not let off so easily – after extremely racist statements were found on his Facebook profile, he was dismissed from service. So, going back to the raid on Alby: If for the sake of argument we accept the inspector’s assertion that the cafe was open – why did an entire caravan of police cars and a couple dozen police show up? Why did the BORDER POLICE rather than the city police take the lead on the situation? This was clearly not a run-of-the-mill business infraction situation. It appears that the association between Alby and the incident with Ben Dayan made it a target (the cafe is a regular hangout for queer and political activist groups, and Ben Dayan runs her own vintage shop next door). But clearly even the original assertion is completely fabricated. When police arrived the business was locked up, and they threatened Chen that if she did not open up, they would break the glass storefront. Here are two videos showing the police conduct (including where an officer clearly goes to where Chen is standing behind the counter and grabs her. He apparently claimed she attacked him). The whole time Chen is asking – what am I being arrested for? and receiving no answer. At one point as she is being pushed into the patrol car, the officer near her says “the arresting officer informed you what for”. The video is uncut from the arrest to that point – and at no time is Chen informed what the arrest is for. As I’m writing this report (Aug 27, late morning Jerusalem time), I have been informed that under a police order the cafe has been shut down for 30 days, for supposed safety violations. As you can see below, every single possible violation has been marked on the form (how likely is that?). Even though I already knew I was living in a state where there is minimal oversight of police and minimal respect for human rights, Israel likes to maintain the *appearance* of propriety, and I really didn’t know that the police could just take away a business’ right to exist with no court approval or intervention. Update ~ noon Jerusalem time: City and Riot police arrive at Alby to harass customers and onlookers, illegally demanding they provide picture ID and leave the premises. Update ~2pm Jerusalem time: Police are trying to remove equipment from the cafe. Activists preventing it. Update ~3pm Jerusalem time: Having faced resistance from the activists and customers, the Riot Police returned with a warrant to remove the business’ computer, under suspicion of “agitation”. How military dictatorship is that? Somewhat Kafkaesque? People are agitated that the business owner is being detained without charge and her business targeted for closure, which retroactively enables the police to seize the cafe’s computer for… agitation? Activists vowing to block them from carrying this out indefinitely. Also, a protest rally is planned this evening in front of the South Tel Aviv police station. If anyone reading this is in the vicinity of Tel Aviv please come (or at least distribute the event). Incidentally, Alby is one of the few queer-friendly (and queer-owned) businesses in Tel Aviv, which is virtually the only queer-friendly place in Israel. I invite anyone who is interested in exposing the true face of Israel in the face of the extreme pinkwashing of the Israeli government and allies organizations worldwide to share this and other stories. I encourage BDS activists to us this too: While for some people (like the Tom Jones representatives on Facebook) Islamophobia and therefore abuse of Palestinians may be palatable, the mindset that allows that abuse affects us all, and until we are all safe, no one is safe. And anti-BDS voices certainly use the supposed queer-friendliness of Israeli authorities as a (very poor) counter argument to Palestinian solidarity. Trigger warning for extreme racism and violence. I really wish this was in English. I’ve translated parts of this below, but there are some things that no amount of translation will ever get across. This is a screenshot from a Facebook page in Hebrew, called “Death to all Terrorists”. Terrorists, apparently, are any and all Arabs. These are responses to an image of dozens of bodies of dead Syrians in body bags. This page (and others) have been publishing various images of victims of the violence in Syria, including children. These responses are typical. Earlier today and yesterday, I was involved in yet another discussion on BDS (Boycott, Divestment and Sanctions upon Israel, a movement calling for cultural boycotts on Israel until they comply with International law regarding treatment of Palestinians and the occupation of Palestinian people and territories). A repeated theme in this discussion is Jews (not necessarily Israelis) who post such statements as “Dear [name of musician], Israel is a peace-seeking nation, and Jews are peace-seeking people! We never start wars, we respect people, we are the victims!” and so on and so forth. I really want to expose the true mindset in Israel. It is NOT peaceful or peace-seeking. Naftali Bennet, Israel’s Minister of Commerce, recently admitted to killing an unspecified number of Arabs, for unspecified reasons, and declared that is just fine. The people in this post, are not some fringe group. These are regular Israelis, and what they have written here – translated below – are things I hear every day. Everywhere I go. Read through, if you can stomach it, and judge for yourselves. Don’t worry about the children, they’d just grow up to be terrorists anyway. LOLOL what a pleasure! And I’m not a racist, just a [sports team] fan! Buh-bye! What a waste of good body bags. Here’s to more in the ditch, amen. Hoping for more, and more! Great to wake up to good news in the morning! Only 1000… Hoping for more. As Naftali Bennet said, “Terrorists must be killed”. Period. God willing, all the Arabs will die, amen. LOL, you all are making me laugh. [image, parodying Arabic phrasing] what a beautiful sight! Let’s party! Who’ll bring the sweets? I’ll bring chips. Oh no, what a tragedy!…. A thousand is too few! So much fun to see this picture! Amen that this happens again and they all die! Amen! Only 1000? Can’t we add some zeros to that? My son is only four, and he passed by the computer so I quickly closed the picture, but he glimpsed it and asked me, “What’s that? Rats?” LOLOL He pretty much got it right. Too bad there weren’t more. So wonderful, God willing we’ll see beautiful images like this every day. Do the math – how many virgins required? Now repeat this by thousands of Facebook accounts, groups, cafes, buses, homes, army bases, schools, workplaces…. This is normal Israel, when it isn’t being pinkwashed, whitewashed, propagandized, and spinned. 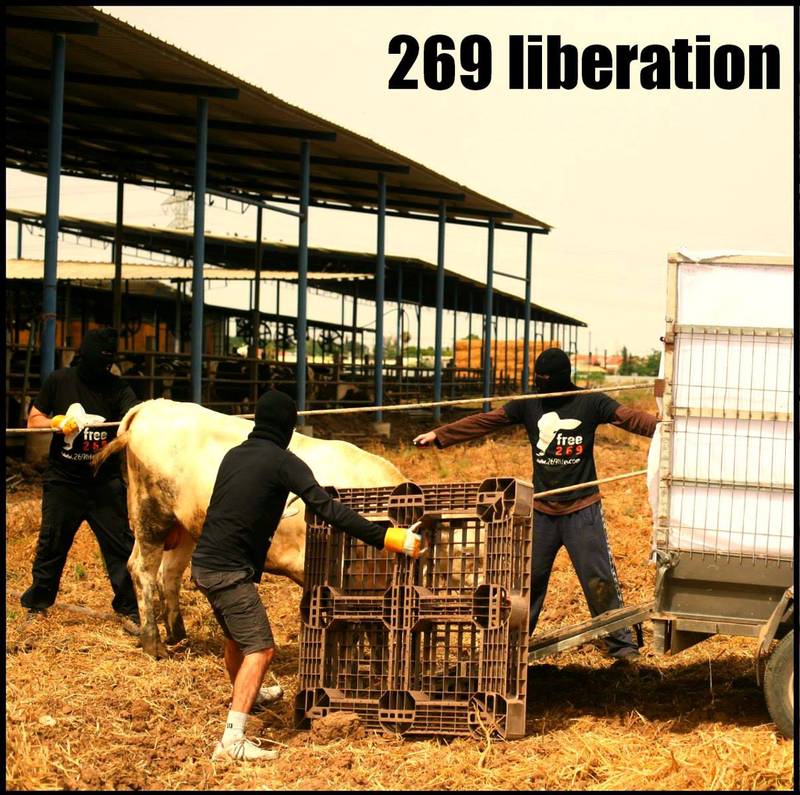 You might have read my previous posts on the 269 movement – an animal liberation movement that started in Israel/Occupied Palestine, and spread worldwide. 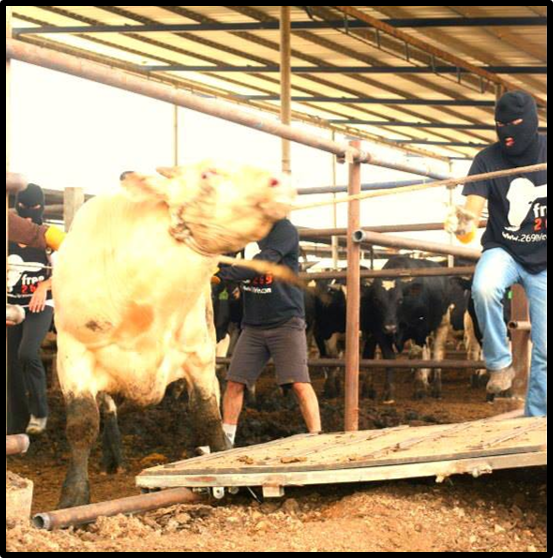 The group gained international attention when they did a public branding event – activists gathered in the center of Tel Aviv and got branded with the number 269 – in honor of the namesake of the movement, a calf being raised for beef known only by the number stapled to his ear. 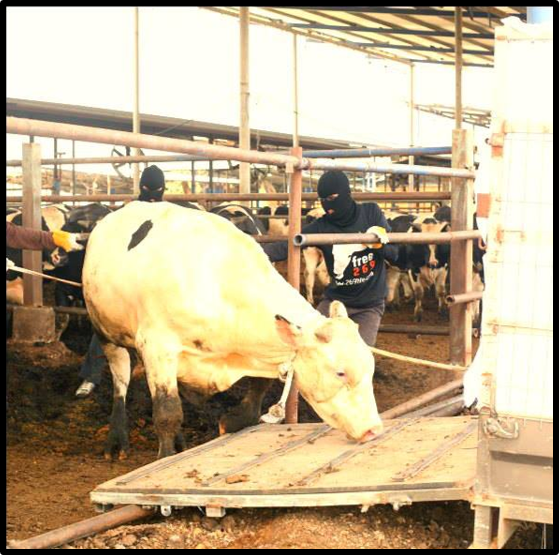 ANYWAY – The exciting news is that earlier today an anonymous message was delivered to the 269 Life site, saying that activists liberated 269 – now a young bull – only hours before he was to be slaughtered, and took him to safety. The action took place several weeks ago, and they say that 269 is doing well. It is only one life out of the billions that will be sacrificed to the human lust for murdered flesh… But it is a LIFE. And a highly symbolic one. I can’t think of better news to start my day! ** The next international solidarity event will take place on September 26, 2013! Find out where the event nearest you is taking place, or organize your own local event and send pictures to to 269 Life!